To interpret at the highest level the performer must experience the cultures which inspire composers. The Summer Institute will pay for your entrance fees to all performances given by the Rome Festival and to all the cultural sites listed below. Additionally, you are welcome to obtain authorization for reimbursement to visit local sites in Rome which are not on the list. 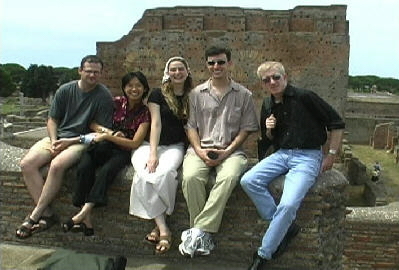 You can walk in the footsteps of the many composers who came to Rome for inspiration. The Summer Institute will organize group visits to sites marked with an asterisk (*) and sites not on the list. The leader of the group visit will pay your entrance fee. To have the entrance fee paid for unmarked sites, which we encourage you to visit on your own, mail each entrance fee receipt with your name and the date of your visit printed on the back to our New York address listed below by the 15th of September. The Summer Institute will mail to you at the address you indicate a reimbursement in dollars for the total of your receipts. Reimbursements will only be given through the New York address. No reimbursements will be given in Rome. In the event a group visit to a marked site ( * ) is canceled or you have a note from a conductor, artist-teacher, or coach explaining why you could not go on the organized visit to a marked site, the Summer Institute will pay for your individual visit to a marked site. The administration of the Summer Institute organizes the schedule specifically to provide you with the time to visit and enjoy learning from the recommended cultural sites which follow. We wish you happy, enlightening visit.